The primary document that the model uses to manipulate and store data is called a workbook. Each workbook contains at least one worksheet that is defined as a collection of cells organized in rows and columns. A worksheet can also be viewed as a tabular working surface that you use to enter and organize your data. Typically, a single workbook holds together several worksheets that contain related information. For example, a workbook named Annual Budget can contain four worksheets that split the data for each quarter. 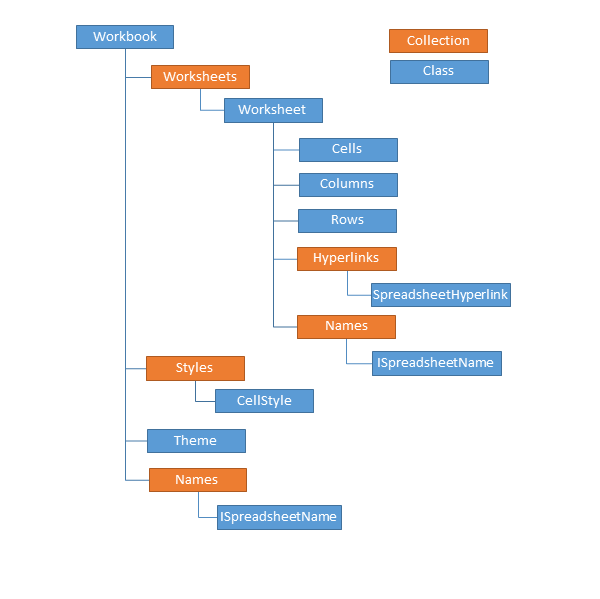 The documentation of RadSpreadsheet's document model contains several Working with * sections that illustrate general concepts about Workbooks, Worksheets, Cells, and Rows and Columns respectively. Each of these folders covers the fundamentals of the class and provides examples about the CRUD operations of the object. The documentation also includes a Features folder that contains information about all features currently supported by the model of RadSpreadsheet. In the Import/Export section you will find detailed information and multiple examples for using all format providers.